A staircase surrounded by vertical white ribs sits at the centre of tech company Square's offices in New York, by interior designer Magdalena Keck. Square, which provides digital finance services, has taken over three storeys of a landmark building in the Cast Iron district of New York's SoHo. The space totals 30,000 square feet (2,787 square metres), divided equally over the floors, and the interiors for two levels are completed so far. New York-based Magdalena Keck Interior Design worked with Bostudio Architecture on the project, which resulted in a pared-back design not typically found at offices for technology companies. "Square is known for clean, minimal, reason driven design aesthetic, and an obsessive attention to detail," said Keck. To keep in line with the company's identity, the team stuck by a strict set of rules and material palette. White and dark grey surfaces and fixtures are paired with exposed red brick walls and pale timber flooring. 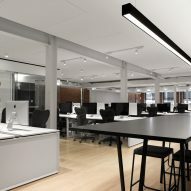 A similar monochrome palette was used at the recently completed head office for website building service Squarespace, located close by. At the centre of Square's workspace is a feature staircase, surrounded by white slats that allow light into the core. "The staircase is a central, unifying element, born from the philosophy of the company," Keck said. "It is a core, established as a visual focal point from which various space elements radiate." Pops of magenta are added with cushions, placed on bleacher seats beside the bottom few steps. The lower level houses open-plan desk areas, a kitchen and a large conference room. Above is a cafe, which features custom white oak millwork that forms shelves between the charcoal-coloured walls. Also in this space is a bar-height communal table and stools, providing a gathering place for employees. 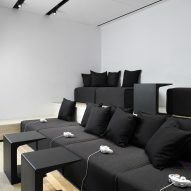 Alternatively, workers can relax and play video games in a lounge room filled with upholstered furniture.